Traders on Roman Road and Broadway Market are determined not to give in to the threat of rising rents or the popularity of online shopping. These historic London streets have in insatiable chatter and bustle and are the focus for a thriving community. Yet businesses here are facing some of the toughest trading conditions they can remember. They’re among those taking part in East End Indie Weekend at the start of December – an event promoting the character and community of East London and encouraging people to spend locally this Christmas. Some are marking the event with festive treats and giveaways. The team at the Local Buyers Club, a new website and discount card promoting East London’s best independent businesses, has been speaking with traders in these iconic streets and getting to the heart of the issues impacting them. Jenna Fansa, a founder of the Local Buyers Club, said: “Local businesses talk passionately about the vibrancy of these streets, the multiculturalism, the area’s incredible history and the character having lots of independent businesses brings. Among the local businesses taking part in Indie Weekend on December 1 st , 2 nd and 3rd are F. Cooke, a jellied eel ad pie and mash shop in Broadway Market which has been in the area since 1862 – their legendary pies are served with parsley sauce. Another well-loved local pie shop is G Kelly Pie and Mash, which opened in 1937 but is currently closed for renovations. These streets were at the epicentre of the Suffragette movement. Sylvia Pankhurst, a campaigner for women’s rights and for their right to vote opened a nursery, a cost-price restaurant and a co-operative toy factory in Bow in a bid to improve conditions for local women. The Suffragette East End headquarters were within 100 metres of Roman Road. Time Out’s Matt Breen recently said of Roman Road: “The affluent residents and pricey establishments are multiplying. But that’s the beauty of Roman Road: you get the best of both worlds. Wine merchant and Enoteca Vinarius has been in Roman Road for three years, offering delicious food and wine by the glass. Eugenio Ciccarelli, a Director at Vinarius, said their biggest threat was: “the combination of rising business rates and the pressure, from developers, to convert business space into residential.” They’re planning a charity wine tasting event on Tuesday December 19 th in aid of the MS Society. Card and gift shop SNAP, which has been trading for over five years, said one of the best things about the area is the Roman Road market, which happens three times a week and their proximity to Victoria Park. They cited the internet as among their biggest threats. They’re giving out festive treats to customers on the Saturday of East End Indie Weekend. FountLondon, a shop, food space and nursery (rated Outstanding) under the arches near Broadway Market, told the Local Buyers Club they’d paid a high rent to compete with more established businesses. They’re fearful an imminent rent review could prove devastating for business. Staff at Italian deli, wine shop and restaurant Symposium described Roman Road as “up and coming.” They’re offering 10% off a mixed box of six bottles of wine between December 1 st and 23rd and running a tasting with Samuel Smith organic beers in early December. Black Truffle, a shoe and clothing boutique which has been in Broadway Market for 15 years, is gearing up for Christmas with plans for some special offers and Roman Road lettings company Marybow Property is marking Indie Weekend with a free lettings MOT for landlords. Among the other Broadway Market businesses taking part in Indie Weekend are The Broadway Bookshop, Pavilion Bakery, Il Cudega restaurant, Climpson & Sons, L’eau à La Bouche Delicatessen & Café, 69b Boutique, textile and craft shop Fabrications, materials specialist SurfaceMatter and Fin & Flounder fishmonger. Traders in Roman Road are also preparing for a Christmas Fair on Saturday December 16 th from 11am until 4pm. There’ll be Santa’s grotto, face-painting and craft activities for children, performances by local choirs, a designer-maker market and hot food and drink. 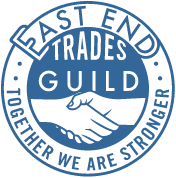 Look out for the blue plaques in our members premises on Roman Road and Broadway Market and you could win a gigantic hamper stuffed with our members goods! We will draw names from a hat the following week and notify winners via Instagram. 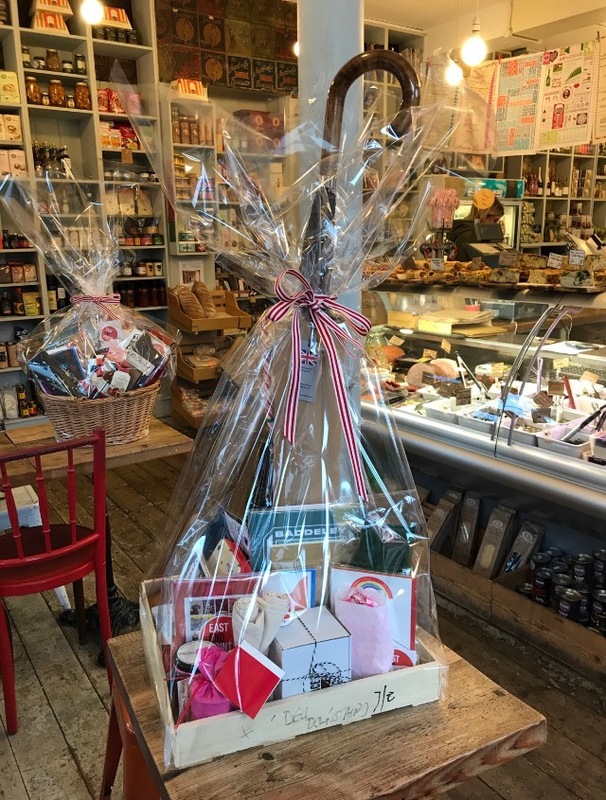 One of our magnificent hampers beautifully wrapped by The Deli Downstairs in Victoria Park, see a hamper on display today at Well Street Market! Photograph of Bob Cooke by Sarah Ainslie, kind permission of Spitalfields Life.